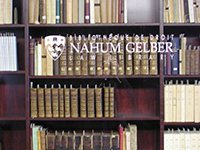 The archives contain the working papers of one of the principal organs for private law reform in Quebec history. The archives are made up of the C.C.R.O.’s working papers, reports, correspondence, minutes of meetings, internal memoranda, etc., dating mostly between 1966 and 1979. The President of the C.C.R.O., Professor Paul-André Crépeau, donated his copies of the material to McGill University. There are approximately 4000 documents in the archives, stored in over 300 volumes. The total collection of the papers of the C.C.R.O. in the possession of McGill University amounts to approximately 40,000 pages. In 1995, an index to the archives was created by Professors John E.C. Brierley and Nicholas Kasirer that has been incorporated into the database. In 2008, with significant support from the Wainwright Trust, a project of digitizing the archives was begun. This led to the creation of this website, with the assistance and support of the Library Technology Services section of McGill University Library. The archives of the C.C.R.O. is a rich source for those interested in the working methods of the agency charged with a re-codification of private law in the civilian manner in North America.